The stethoscope of the 21st century may have arrived. On Oct. 20, GE unveiled the Vscan, a medical imaging tool as compact as a cell phone and as powerful as a large ultrasound console. 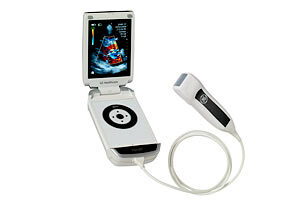 Doctors can use it to look inside a patient's body and instantly see fluid around the heart, for example, or a baby in the breech position. In a field where minutes can make the difference between life and death, the Vscan  not yet commercially available  could improve the way medicine is practiced everywhere, from cutting-edge ERs to makeshift village clinics.